Our Future Rooted in Our Past: Need A Personal Genealogist? Have you ever wished to have a genealogist or family history consultant could sit by you or be available at your beckon call when you have a question, wonder how to write your personal history, or need ideas for a family reunion? If you need help with starting your family history or genealogical pursuits, help is no further away than a click of the mouse at the Ogden Regional Family History Center Desktop that you can view in the comfort of your own home, office or other place that you might log onto the internet. The site is organized in a user friendly manner with all of the links located on the left side tool bar. The desktop provides you with information regarding organization of family files including links to downloading the various programs for the PC or MAC environment. Other features of this site include instruction on how to write a history, penny postcards, photographs, website design tutorials, "Teach Me" tutorial CD that is viewable online, and various other tidbits of information including where and how to start your searching. If you have been doing genealogy for a while, you most likely are familiar with most of the information but the site could provide you with ideas on how to create your own family history website for some concepts of genealogical research. If you are new to genealogy, this is a great site to review and get some hints. Also listed on this site are classes that are taught at the center which is located in Ogden Utah. Whether you are new to genealogy or a seasoned veteran, there are numerous ideas that may be of assistance to you on this website. 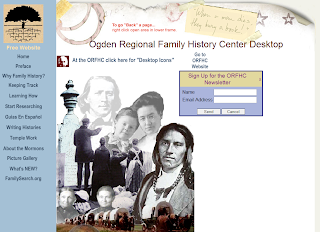 If you would like to browse or begin learning new concept of genealogical work, you will want to check out the Ogden Regional Family History Center Desktop website. Have fun!